Quick overview TRCW3500-01 Engine: Vanguard 35hp, Air Cooled, gasoline engine. Engine: Vanguard 35hp, Air Cooled, gasoline engine. Pump: Triplex Hi-pressure General industrial pump, Belt driven (dual belts) w/ belt guard, Pressure relief valve, and thermal relief valve, Adjustable unloader valve. Water Tank: 225 gallon holding tank, Leg Tank Design w/Stainless Steel holding straps, Tank w/ hose fitting for easy refill, 1-1/2” Drain line w/ball valve, Screen filter on pressure washer feed line, Return feed line on pump for a cooler operation. 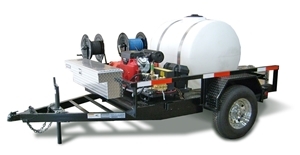 Hose Reels: Unit will come with two hose reels. One for the Hi-pressure hose (100’) and another for the water feed hose for the tank (100’). Additional Features: Unit will come with one set of High pressure spray nozzles (4), downstream soap injector and one 36” Trigger gun and & lance assembly.